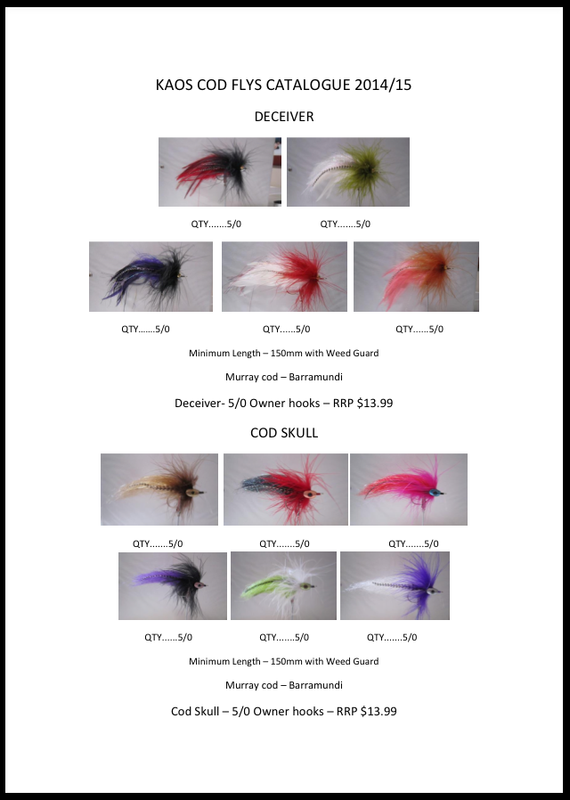 KAOS COD FLYS – CATALOGUE – MURRAY COD FLY FISHING….. The talk of the day and weeks to come will be all about you landing a fish on fly. Maybe you’re first time or the hundredth time, for me it’s always a great feeling and for your fishing partner as they get involved too by netting the fish. The bug is hard to shake once you have landed a native on fly and the only thing you talk about is the last time you were out hooking up or the next time you can get out on the water chasing these magnificent green backs. In your favor too around the camp fire while enjoying a yarn about how big you’re biggest is or the one that got away, is if you have caught a Murray Cod on fly and i can tell you now not too many anglers can say they have, you will always have a story to tell. This is why fly fishing for native’s but specialty Murray Cod is going to be the next big thing.